Need help running Need for Speed part 3 or 4? For Need For Speed 3, make sure the "Voodoo 3 Patch" (NFS3_UPDATE.ZIP) has already been installed, even for OEM version of the game that came bundled with the Voodoo3. Follow the directions with the patch PRECISELY, especially the copying of the VOODOO2A.DLL file (5/4/1999, 108KB) to the games install directory (this allows for higher resolutions to be selected in game, as high as 1600x1200 from what I can tell). Run the 3D Device Setup program in the NFS3/4 Program Group at least once, and select "Direct3D Device 1". 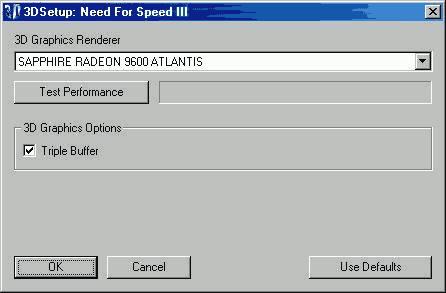 "3D Card" = "3Dfx Voodoo3"
"3D Card Description" = "3dfx Voodoo3"
ATI Driver Version 4.12 (non Catalyst Control Center version - "classic" version) with Default D3D/OpenGL settings. All detailed Glide Wrapper settings testing was done on NFS3 (not NFS4), including comments below.. Generate Mipmaps caused texture artifacts/corruption on vertical textures (in Race), might want to look into that.. Simple and Fancy Shaders both caused weird corruption in the game's intro video/movie sequence, might want to look into that..
Thread Policy should be stressed for Pentium 4 HT users, maybe even defaulted to "Use Render Thread" upon install on such systems. I've included .INF files that do the absolute minimum to change the games from D3D mode into Glide (Voodoo2) mode, and back again.. These work for both NFS3 and NFS4 regardless of how the game is currently configured. I've used them to test/compare D3D and Glide mode using your Glide Wrapper on my Radeon 9600, and/or with original Glide on a Voodoo3. Again, for Need for Speed 3 (Hot Pursuit) I HIGHLY recommend installing the "Voodoo 3 Update" (NFS3_UPDATE.ZIP) in order to be able to gain access to higher resolutions/etc (like 1600x1200) under "voodoo2" thrash mode. 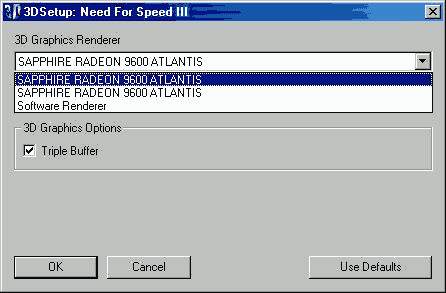 It is also possible to get the game to detect (and specifically list) modern video cards using the games' 3D Setup (3DSETUP.EXE) utility, and even have two instances of a single card listed available as choices in the drop down box (aside from the Software Renderer mode), one for Glide mode, the other for Direct3D mode. I've included a couple of screen shots of the 3DSETUP.EXE utility detecting my Radeon 9600 with two instances, one for Direct3D, and one for Glide. At this time, this procedure takes far more effort than just using the INF files to switch between modes, though it does have the advantage of working within the process of the games natural video card detection and configuration process that end users might expect to use (3D Setup). I may write a little utility that makes all the necessary registry and game settings changes and adjustments so users can run the 3D Setup utility to both specifically detect their modern card, and, choose between the two modes. For the record, this was a technique that I developed back in 1998/1999 when the Voodoo3 was released and I wanted to easily switch between Glide and Direct3D modes so I could compare etc. Please feel free to distribute these 4 INF files so that ANYONE can EASILY switch to/from Glide mode for NFS3/4, assuming they have your Glide Wrapper (or original Glide itself) installed. If I write the utility to update the game for modern card detection/mode switching using the 3D Setup utility as I described, I'll forward that to you too (I don't maintain any web space at this time).